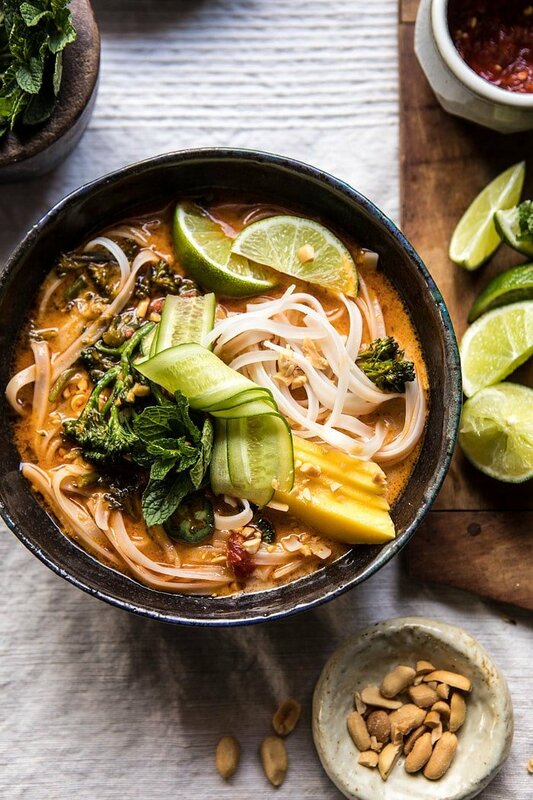 January Mondays call for my favorite 20 Minute Peanut Noodle Soup with Lime Mango. And I’m back with more colorful bowls of (cozy, healthy) food. To be expected, right? If you didn’t notice, I am loving all the colorful food January has been bringing (did you guys see this winter broccoli salad?!). It’s making these short, cold, and rather colorless days feel bright and fresh! Plus, I hear all you east coast people are basically freezing your butts off and covered in snow, so I figured a warm and cozy soup was the perfect dinner to share today. Speaking of the east coast snow and cold temperatures, I keep watching everyone’s instagram stories in awe of all the snow everyone has been getting. It’s kind of feeling like the east coast got our western winter. I am about 80% jealous of their snowfall and about 20% thankful to not be shoveling myself out of snow. Although we did get a large amount of snow on Christmas, we have had straight sunshine since. We also got about 6 inches on Saturday night, so we’re still getting a little glimpse of winter, just not like it normally is. Watch, come April (or May) we’ll get dumped on with snow and I’ll be begging for spring flowers. Pretty much happens every year, I want spring and winter is just not ready to let go. 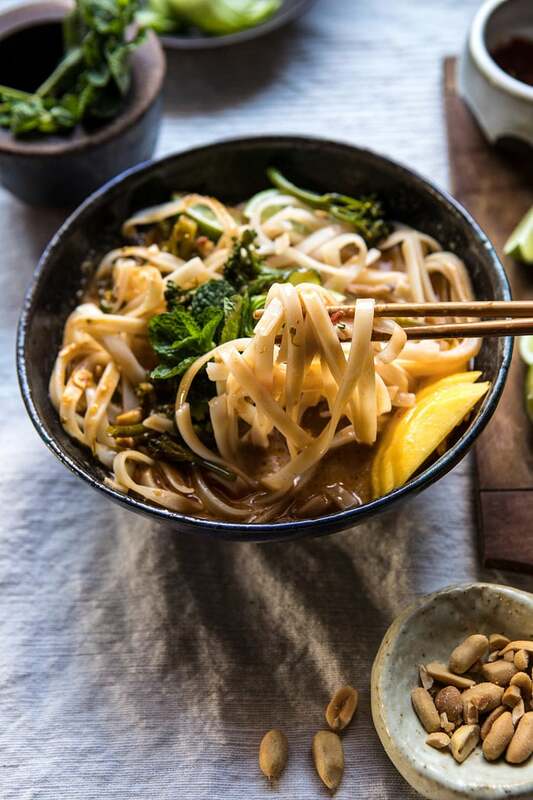 Anyway, the point is, I wanted to share a warming recipe for everyone to cozy up to tonight, and this peanut noodle soup is the perfect thing. 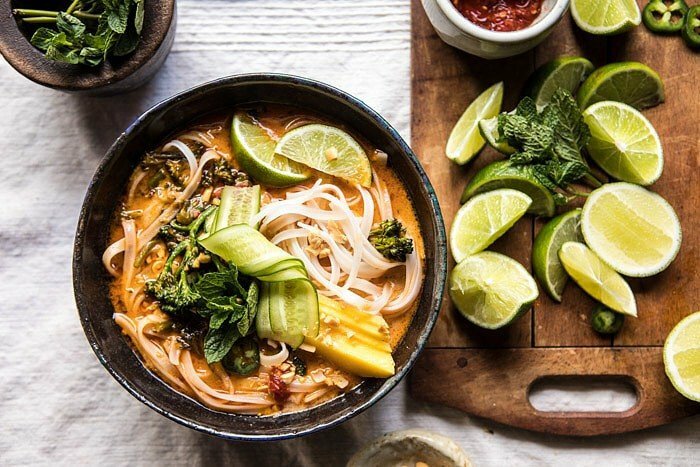 I based this soup off of one of my favorite Asian dishes, Laksa. 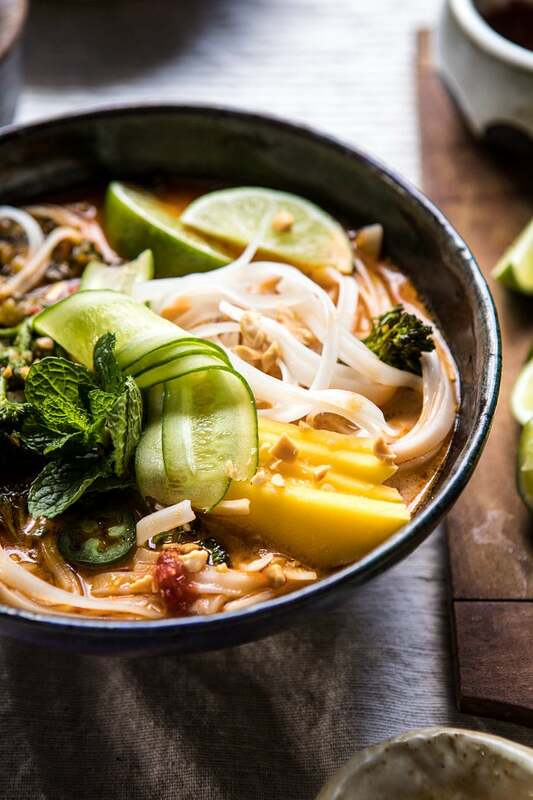 Laksa is a traditional Asian street food made with a coconut milk base and rice noodles. 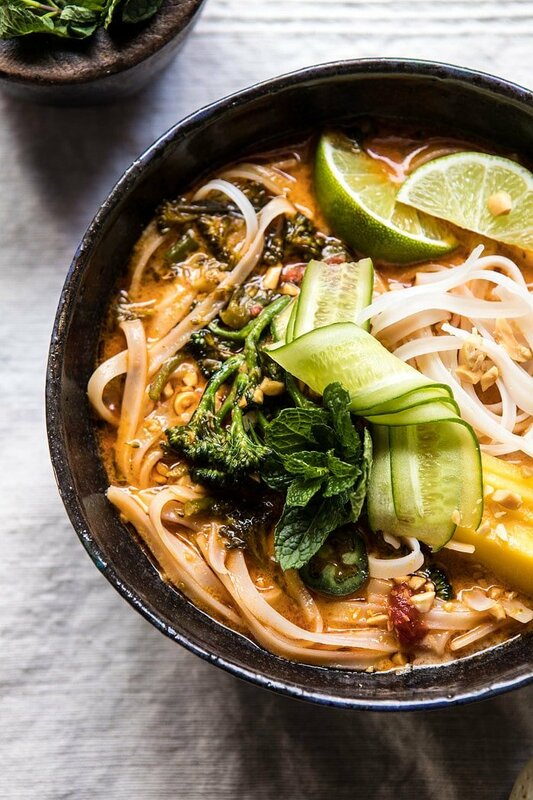 It’s basically Asian noodle soup. 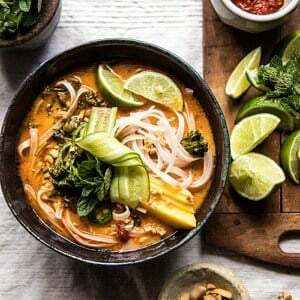 I’ve taken some of the elements of Laksa and made a quick and easy peanut version topped with mango and fresh greens. 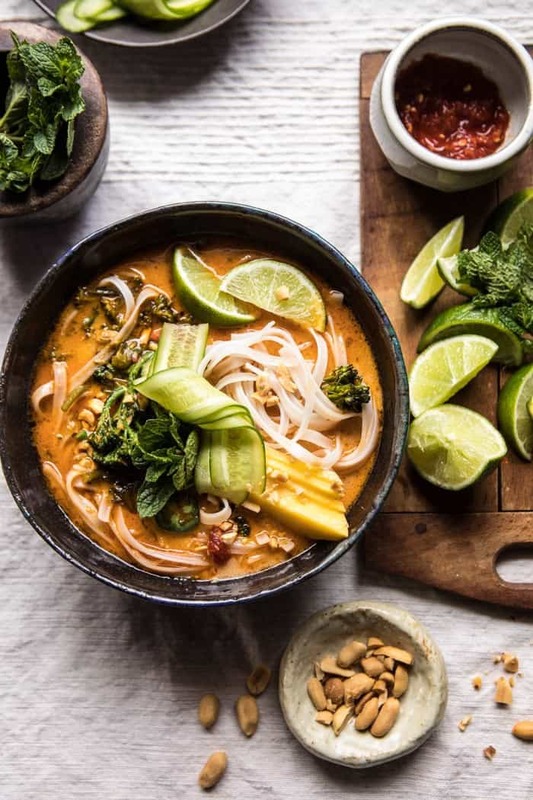 Traditionally Laksa is made with chicken, fried tofu, or a combination of both. Because I wanted to keep this recipe on the healthy side, and keep it quick cooking, I opted to make my soup vegetarian and use peanut butter for protein and added flavor. Okay, and I just really LOVE peanut based soups, they’re my favorite. Especially when rice noodles and mango are involved. Too good. The very best part though is that even though this soup cooks up quick, it still gives off an explosion of flavor and color. Spicy, gingery, peanutty, coconutty, and just a little salty, plus a little sweet. YUM. Trust me, it’s so good. 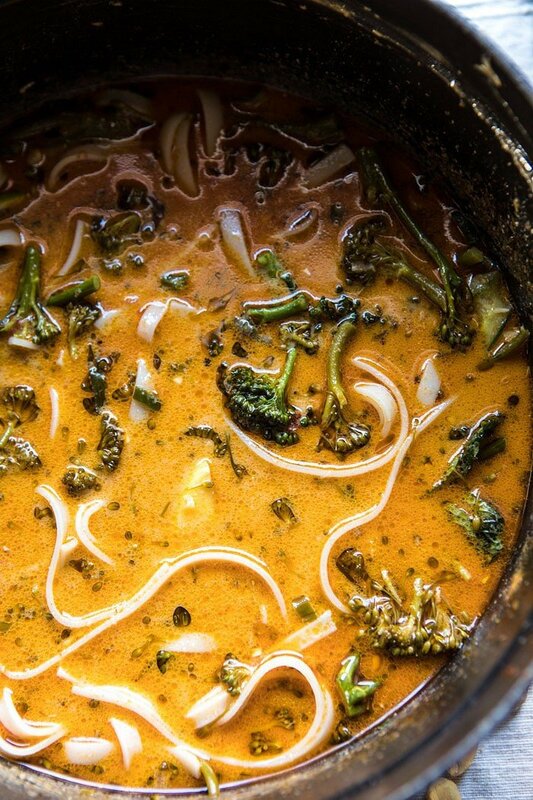 I added a couple of bunches of broccoli for some much needed veggies, a good amount of peanut butter, plenty of coconut milk, and topped each bowl off with fresh mango and lime zest. The mango and lime zest are key if you ask me, but then you all know how much I LOVE fruit in my savory recipes. Can’t help it. For real though, I do think the sweet mango, and citrus from the lime, balance the spiciness of the soup. If you wanted to bulk up the protein content, you could add chickpeas or even chicken. You can also top the bowls with some fried tofu, but personally I love the soup just as is. It’s simple, filling, healthy, and cozy. 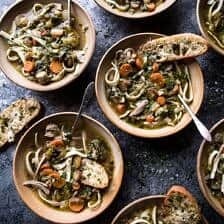 Aka, the perfect dinner for cold nights when all you really want to do is make a quick dinner, grab your food and huddle by the fire, space heater, or you know, in my case the oven (planted on the floor right in front of my oven as I type this). 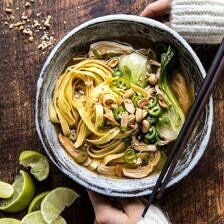 20 Minute Peanut Noodle Soup with Lime Mango from Half Baked Harvest on Vimeo. The perfect dinner for cold nights when all you really want to do is make a quick dinner, grab your food, and huddle by the fire! 1. Heat the oil in a large pot over medium heat. When the oil shimmers, add the garlic, ginger, chili paste, and green onions. Cook 30 seconds to 1 minute until fragrant. Add the both, peanut butter, soy sauce, and coconut milk, stirring to combine. Add the broccoli and cook until tender, about 8-10 minutes. 2. Meanwhile, cook the rice noodles according to package directions. 3. Once the broccoli is tender, remove it from the heat and stir in the cilantro and mint. Ladle the soup into bowls and add a big handful of rice noodles. Top with mango, cucumbers, and peanuts. 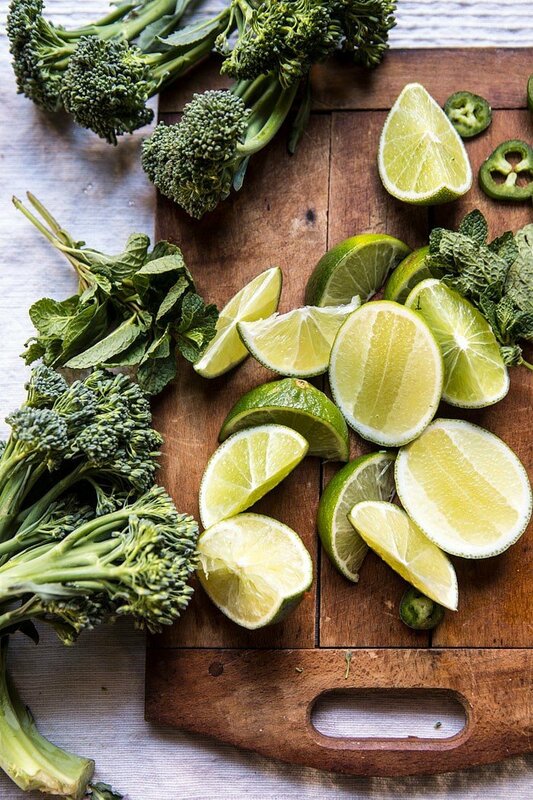 Zest the lime over each bowl. Enjoy! Monday night is looking pretty good at the moment. Can’t wait. 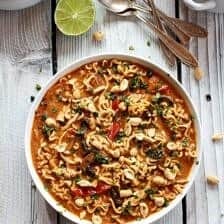 Ginger Peanut Chicken Noodle Soup. It’s been so cold that hot soup is all I’ve been craving, lately! I share you love of peanut based soups, and this one looks magnificent. I really want to try it. One little problem – I can’t stand broccoli ( its the bitter that is one of the basic flavors that I find objectionable). and I will usually just leave it out of recipes, or possibly substitute asparagus, peas or wilt some spinach, but none of these options feel right for this one. Since the broccoli looks to be an integral part of this, can you suggest an alternative? Enjoy your writing, and great photography. Truly creative and inspirational recipes. I have several stacked up to try. Not really fair to rate since I haven’t done it yet, but sure looks like at least four stars (easily gotta be a five without the broccoli). Help! – I don’t want to miss out on make this! Oh my Tieghan! This looks just delicious. So cozy for this wintry weather we’re having! Snow’s coming and this needs to happen at our house! Yes! So glad you like this! Thank you Mary Ann! Gorgeous, soup is just what I’m craving on this rainy night and this is perfect! I like this soup and think it would be lovely during these colder nights. I live in FL right now, but still enjoy cozy (and bright) soups. 😉 I like the addition of peanut butter with the rice noodles. Do you have any recommendations for what to use instead of the chili paste? I hope you’re staying warm by the oven! Haha I also tend to hover near the oven when it’s cold and love the warm air. 🙂 Hopefully it won’t keep snowing on CO come April. Do you have any trips planned for the spring? Maybe you and Asher can have a mini vacation together? I’m doing a Whole30 now, so peanut butter is a no-go. I’ll either try to make a version with another nut butter substitute & coconut aminos for soy sauce / zoodles for rice noodles, or I’ll stick it out and make this in February! Either way, I WILL make this eventually! Speaking of peanut butter, have you ever tried peanut butter mixed with butternut squash? I read about it in an ethnic cookbook (it’s a Zimbabwean recipe, I think), and it is delicious!! I know it sounds unconventional, but it is truly one of the best things I’ve ever had. So happy you’re liking this! I hope you can enjoy it maybe after the Whole30! I have not tried that.. but really want to now! Sounds so different! Thank you Brynn! Morning Tieghan, I made this last night, as an exciting variation from the same-old, same-old and it was a lovely refreshing, exotic taste on a cold Monday night. Thank you! I am really glad you enjoyed this! Thank you Liz! I made this for dinner tonight, and it was a real hit. I do have a question regarding the peanut butter you used. Was it a) the “natural” kind without any added sweeteners, and b) salted or not? Thank you for this recipe. I like to use organic, salted peanut butter (no added sugars). For anyone wondering I substituted almond butter for the peanut butter. And topped with almonds. And I could only find red curry paste so I used that. And added a ton of mushrooms and lots of salt. Seems like a very adaptable recipe. Will make it again for sure!! I am so glad you liked this Tammy! Thank you!! I loved this recipe! The title doesn’t lie, it really comes together very quickly and it is very very tasty! I would (and did) add some salt to the recipe, however. Thank you so much Cati! I am so glad you enjoyed this recipe! Just made this for my family. I had it as is but cooked some chicken in the oven in a bit of the soup for my carnivore relatives. Thumbs up all round! Thank you, it’s so good and so easy to make too! I am so glad you liked this! Thank you Tay! This looks amazing! I have a few packages of dry millet/rice ramen noodles by Lotus Foods. Would these work in the recipe, or would they be too thin? If they would work, how many ounces do you think I should use? Thank you so much! I made the soup last week without the mango and cucumber and also without mint and cilantro because these two were not available. I added one small red bell pepper. The soup was delicious! Thank you very much for the recipe! Hey there! This looks AMAZING and I want to try but I dont Love broccoli? Any other vegetable suggestions? What type of chili paste? You have so many delicious peanut soups that I want to make them all right now! Unfortunately my husband is allergic to coconut so no coconut milk. Do you know of any decent alternative that won’t ruin the flavor? My rice noodles soaked up too much of the broth when I whipped it out for lunch, so instead I ate this AMAZING warm peanut noodle dish. One of my favorites for sure. I made this tonight and LOVED it. My husband liked it as well, which is a bonus because it can be difficult to find a meal without meat that he truly enjoys. It was full of flavor and easy to make. We will be adding this to our rotation. I am so happy to hear that! Thank you Kristi! Amazing!!! Added a bunch of random veggies and this was to die for! Adding this to my normal rotation. Perfect! I am so glad you liked these Rachel! Tieghan, thanks so much for the suggestions. Did this last night with a handful of baby spinach instead of the broccolini and it worked beautifully. Flavor was superb with just the right amount of “zing”, and a gorgeous presentation. Wife was duly impressed. Made a fresh loaf of ciabatta to go with it, A fun day in the kitchen! Bon Apetit need to step back while I try a couple more. Next up is mushroom ravioli and then I gotta try those tacos! Thanks for the inspiration – this old guy is having a ball with a new hobby. I am so glad you enjoyed this and hope you love the mushroom ravioli and the tacos! Thank you Craig! 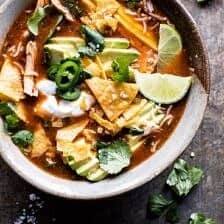 I made this soup last night and it was so quick and delicious. You really nailed the flavor combination. I loved this soup so much!! It was quick to make and I was excited to use some different flavors. My husband gobbled it up real fast. Thanks Tieghan!! This sounds delicious! However, I have a serious allergy to mango. Can this be made without it? trying this in a crockpot….due to the fact that we are remodeling and our kitchen equals crockpot. I will let you know my success rate! Thank you Laura! I hope you love this and it turns out amazing! Really enjoyed this recipe! It was so easy to make and had great flavors. Thank you! This was so delicious we made it twice. My husband and I like spicy so we doubled the chili paste. Super easy too!